We want second hand blow moulding machine having capacity 5 ltr and 60 ltr. We need less used good condition machinery. We require complete laminated plastic tube filling line of minimum 120 tube per minute capacity, having following attachment. Heavy duty turret lathe machine for sale. Make - Ward UK. Swing over bed 780 mm, center height 1500 mm. It is app. 20 year old machine. Price - Rs. 4.2 Lacs. We want 2 colour rotogravure printing machine. We immediately wish to buy second hand rotogravure printing machine having 6 - 8 colours. We want to sale 2 plastic recycling scrap grinder machine of 24 inch having 50 HP motor. We want to sell 6 colour rotogravure printing machine. Machine is brand new. Film width 24 inches. Price - Rs. 13.50 Lacs. For sale 500 ML CMP single station blow mouling machine. It has Telemecanic PLC control. Year - 1999. Price - Rs. 3.25 Lacs. 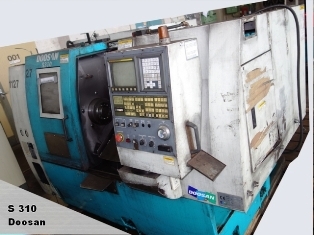 CNC turning center for sale in Delhi. Make - Doosan, Korea. Model - S310. It has Fanuc CNC control 21 TF. Turning diameter 310 MM length 450 MM. 45 years old established brass and CPVC pipe fittings business for sale. Turnover - Rs. 4 crore. Ticket - 11 Crore. We wish to buy CNC turning center having 8 inches chuck size. Make - Jyoti Ace, LMW Lokesh with Fanuc control. We wish to buy 40 ton Romex make plastic vertical injection moulding machine. We need 6 colour flexo printing machine having width 24 to 26 inch. It should not older than 5 year . We urgently require 6 colours flexo printing machine for BOPP, LD film. Film width 18 mm. I am looking to buy Windsor make injection moulding machine having 450 and 800 ton capacity. We are looking for used 4 color offset sheet fed printing machine. Size 18 x 25, 28 × 40 inches. We prefer to buy Komori , Heidelberg, Planeta machine.